limedragon :) » Blog Archive » Who woulda thunk? I almost wanted to try this cereal, just because Depplicious is plastered all over the front. ; ) By now, some of you probably have seen the new Pirates of the Caribbean themed M&M’s candies. There’s a new white chocolate flavor, too. ROFLOL!!! 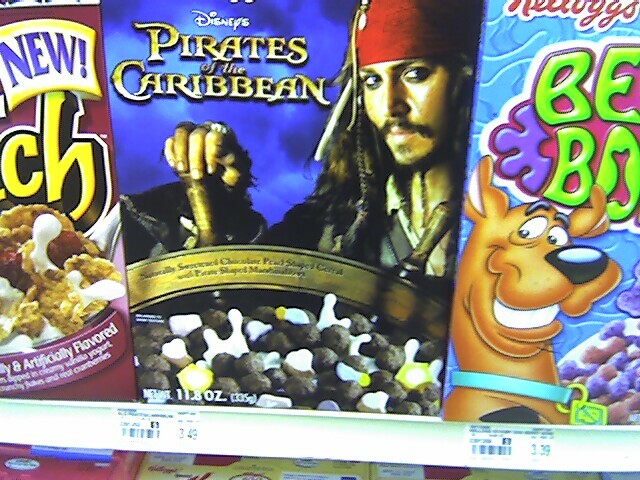 I never even IMAGINED I’d see Depp on a cereal box. Heh, that boggles the mind, doesn’t it?! I think you should have plenty of knitting options this weekend – have fun! \Another huge JD fan too. I wasn’t a fan of 21 Jump Street, but I did fall in love with him in “Cry Baby”, which was also very early. Labmom Sue posted some Pirates flip flops a couple of weeks ago – so cool, but I’m not sure I’d want to step on JD’s face!